APRA Porter Novelli of Sofia, Bulgaria has won the Stevie Award for Best Communications or PR Campaign of the Year - Reputation/Brand Management in the public relations awards categories of The 2011 International Business Awards. Here we look at their award-winning campaign to fight the flab. The devastating facts behind APRA Porter Novelli’s LIVE ACTIVELY! campaign were that each year more and more people in Bulgaria were suffering from obesity and related health problems, particularly children, the elderly, and young working people. Contributing factors included a sedentary lifestyle and a lack of education on balanced nutrition. Bulgaria had recently ranked fifth in Europe for having the most obese population, according to the EU’s Diogenes project. Nestlé Bulgaria is the country’s biggest Nutrition Health and Wellness (NHW) Company, with products targeted at people from all age groups and social and professional backgrounds. Nestlé is also a socially responsible company, dedicated to long-term investment in the health and well being of consumers. Research showed that obesity-related problems strike everyone, even children. APRA Porter Novelli therefore created the LIVE ACTIVELY! campaign for its client Nestlé to address the mass public. Since 2005, APRA Porter Novelli and Nestlé Bulgaria have organized an annual campaign to raise public awareness of the benefits of an active lifestyle and to promote the importance of physical activity in an urban environment. A key element in the project is to promote walking as a simple way to not only stay fit and healthy, but also to improving the environment and reduce air pollution. Sofia, June 20: Official Opening Ceremony, a walkathon, sports activities, concerts, and educational games. Varna, August 10, Nessebar, August 12, and Primorsko, August 14: Beach sports activities, tournaments, and educational games. APRA Porter Novelli supported the 2010 LIVE ACTIVELY! project with a huge communications campaign that included the distribution of thousands of branded hats and T-shirts, special LIVE ACTIVELY! 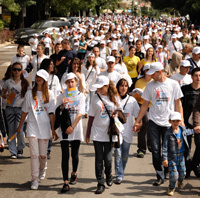 footsteps stuck on the ground to mark the route of the Sofia walkathon; 120,000 leaflet insertions in newspapers and magazines; 60,000 posters; print ads; TV and radio spots, outdoor billboards; Internet banner ads; and a Facebook fan page. In addition, APRA Porter Novelli arranged for the distribution in Sofia schools of 10,000 maps of South Park, with locations and details of related sport activities; and at the opening ceremony, 50 LIVE ACTIVELY! Gold Medals were awarded to top Bulgarian sportsmen. LIVE ACTIVELY! received support from numerous Bulgarian VIPs, including the Bulgarian Prime Minister, Boyko Borissov; the Mayor of Sofia, Yordanka Fandakova; Olympic athletics champion Tereza Marinova; World rhythmic gymnastics champion Iliana Raeva; World Champion weightlifter Armen Nazarian; and Olympic shooting champion Maria Grozdeva. The amount of publicity and total media space devoted to LIVE ACTIVELY! events has doubled each year. Over 300 media outlets covered the events in 2010. The number of participants has grown by over 1,500% over the past 5 years, with 28,500 people taking part in 2010. Over 83,000 people were involved in all the 2010 LIVE ACTIVELY! activities, including 18,000 Facebook fans; and the most active participants received a total of 30,000 sports awards. Bulgaria’s flagship initiative for Nutrition Health and Wellness. Tomislav Tsolov and Lubomir Alamanov founded APRA Porter Novelli in 1994. Under their guidance, it has evolved into one of the most experienced communication groups on the Bulgarian market, setting trends for the whole Bulgarian market. Agencies, and Lubomir Alamanov was its first Chairman, from 2001 to 2008. During these years the foundation of the PR industry in Bulgaria was formed and the Stockholm Chapter of Ethics was adopted. APRA Porter Novelli is a full-service communications agency with a team of over 70 experienced staff. For more information go to www.apraagency.com.